Bishop Walsh carries a long and valued tradition of Catholic secondary education in Western Maryland. Opened in 1966, Bishop Walsh is proudly named after Bishop James Edward Walsh, M.M., a Cumberland native whose lifetime of service in South China resulted in twelve years of imprisonment by the Communist Chinese government. 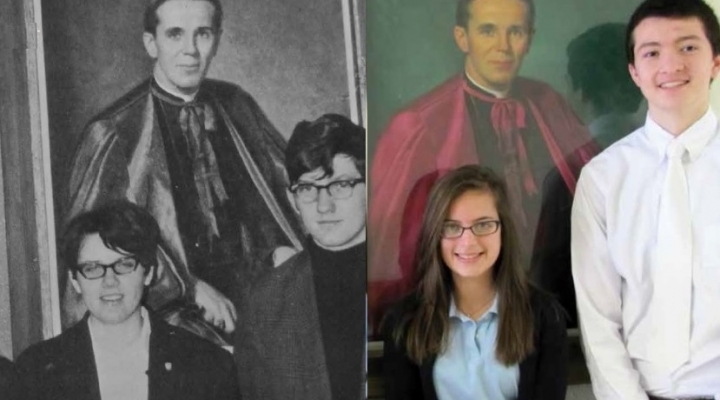 Bishop Walsh was freed in 1970 and, even though the school was dedicated in 1966, he shared a joyous dedication in his honor in Cumberland later that year. Bishop Walsh School is a consolidation of four small high schools: Catholic Girls Central, Ursuline Academy, St. Peter’s High School, and LaSalle High School. The spirit of Bishop Walsh is supported in many ways by the loyal alumni of each of these schools. The Middle School program was added in 1985. The Elementary School program was added in 2002. Bishop Walsh benefits from the continued efforts of the School Sisters of Notre Dame and the school’s dedicated lay faculty and staff.